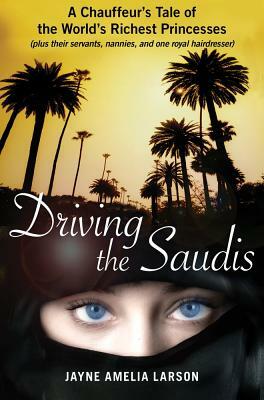 The true-to-life account of a female chauffeur hired to drive the Saudi royal family in Los Angeles. After more than a decade of working in Hollywood, actress Jayne Amelia Larson found herself out of luck, out of work, and out of prospects. When she got hired to drive for the Saudi royal family vaca­tioning in Beverly Hills, Larson thought she’d been handed the golden ticket. She’d heard stories of the Saudis bestowing $20,000 tips and Rolex watches on their drivers, but when the family arrived at LAX with twenty million dollars in cash, Larson realized that she might be in for the ride of her life. With awestruck humor and deep compassion, Larson shares the incredible insights she gained as the lone female in a detail of more than forty chauffeurs assigned to drive a beautiful Saudi princess, her family, and their extensive entourage. At its heart, this is an upstairs-downstairs, true-to-life fable for our global times; a story about the corruption that nearly infinite wealth causes, and about what we all do for money. Equal parts funny, surprising, and insightful, Driving the Saudis provides both entertainment and sharp social commentary on one of the world’s most secretive families. Jayne Amelia Larson is an actress and independent film producer based in Los Angeles. She’s also been an occasional chauffeur between gigs. Her award-winning one-woman show, Driving the Saudis, has shown across the country. "Larson reveals herself to be an articulate and observant writer. She balances colorful tales of excess with musings on women’s roles, and accounts of bad behavior with consideration of the reasons behind it... There’s plenty of fascinating insider info, too, about the job, her charges (Saudi and otherwise), and Los Angeles." "[This] book has a Lives of the Rich and Famous feel about it, but it’s not all about the money and the people who spent it (sometimes in utterly staggering quantities). In addition to the money, there’s some sentiment here, too, as the author comes to know these people, who seem to come from another world, and learns they aren’t so different, after all." "Jayne Amelia Larson spent seven weeks with the .001% and returned with an astonishingly rich story to tell. Honest, compassionate, and deeply entertaining, Driving the Saudis is the story of a woman trying to support her dreams, make a few bucks, and keep a gaggle of pampered princesses happy without losing her mind (or her perspective) in the process." "A stolen glimpse into the world's most important and intriguing family. A wonderful book, wonderfully written."